Yesterday I wrote Hey startup parasites! We don't have time for you. In that post, I explicitly pointed my finger at the deceptive tactics used by Kieretsu Forum and Collision Conference to make money on startups. The people behind both of the organizations have contacted me to apologize and to defend their fees and legitimacy. Paddy G wrote lengthy replies here and here. So to both, I want to be very clear - the big problem I have is not that you charge, but the way you mislead startups in the way you approach us, waste our time, create a false sense of exclusivity and conceal the fee in the initial conversations. If you were to make the fees you charge clear and explicit from the first contact, I wouldn't be blogging about either of you. You have told me today that the month of conversations I had, with not a single mention of the fact that you charge $4,500 for the right to pitch your angel investors, was just an honest mistake. You said that it never happens and I am just unlucky. You argue that the $4,500 fees that you charge are legitimate and provide value to the startup. If that is the case, why not be upfront about these fees? There isn't a single mention of the exorbitant fee on your main Entrepreneur Page. Nor do you mention it on the application page. Another simple mistake? Or do you think it is not important? Or perhaps you realize how totally insane this fee is and how much of an outlier you are with this charge? Just glance at this nascent information sheet that I started; you are in the first place and that's not a good place on this sheet. Considering the scathing coverage you got in Business Insider in 2009, claiming that you forgot to mention the fees on your website is stretching my very flexible imagination beyond its limits. No, that isn't clear at all. 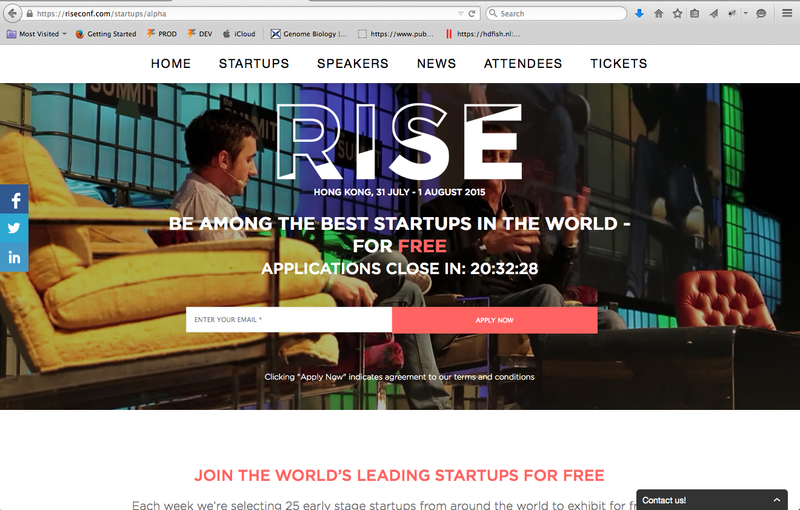 Let me highlight the clear parts to you "Each week we selected 25 early stage startups from around the world to exhibit for free as part of our Collide Program." To me, that says "free." Then you say "The bigger tech companies pay $9,950 to exhibit, meaning exciting, disruptive, early-stage startups can afford to attend no matter what." To me, that again says "free." Then you say "All they will pay is a discounted price for tickets and Collide registration, and we’ll give them a free exhibition stand" and this part is San Francisco fog. I see the "free" in there again. I don't see any clear fees you will charge. How am I supposed to know that this is you saying, "Friend, we have a bargain here - buy this shirt and the sleeves are FREE!" And in the fine print underneath, the same text you quote above. No, this isn't how clarity is defined. I am not a communications major, but you can simplify your messaging and get the pricing across more effectively if you get rid of the misleading "FREE" and instead say, "$1,450 if we invite you and you are selected." And I need to remind you - I didn't come to you via the website. You reached out and said that you are interested in protocols.io. You had me present, asked questions, and told me that we have a chance to be selected to present because what we are doing is important and unusual. When I asksed how you heard of us, you said, "You were referred. We reach out to companies based on the high quality referrals from our trusted network of advisors." The gullible schmuck in me thought that it may be on the heels of our FREE appearance at LeWeb. Of course, once you "selected" us in your rigorous judging, we got the e-mail letting us know about the great honor of being selected, invited, and having the right to get the free exhibit table if we pay you a mere $1,450 instead of $10K. In summary, you both practice deceiving and misleading tactics. I have wasted enough time on your organizations, and I have no further plans to engage in a discussion. It is entirely possible that I am an idiot and simply didn't understand your words or didn't look in the right places. Instead of playing "he said, she said," I will just point people to the countless comments about Kieretsu (here, here and here) and Collision Conference (here and here). There are certainly lots of folks out there feeling the exact same way as me. Unfortunately the fee discussion was not clear enough but I think it is too harsh to leap from this to accusing us of deceptive and misleading tactics. As for your interpretation of our words on the Collision website - of course we want to emphasise the value of what we are offering startups - free exhibition space. But again I think it is too harsh not to accept that the words “All they will pay is a discounted price for tickets and Collide registration” do not clearly state that there will be a price for attending. We are now reexamining our marketing collateral and the way we communicate costs to all attendees. We want everyone to have a great experience at our events and we apologise again for the misunderstanding. I want to wish you every success with your startup. On a final note, if you or anyone following this thread happen to be in Dublin any time in the near future, please come visit the office and meet the team behind our events. Also, as noted previously, would love to meet any entrepreneurs attending Collision in person so don't hesitate to reach out on Twitter. Glad to hear you will be re-examining your marketing and communication in light of this exchange. You did not communicate the costs on the Skype call. As for "I misunderstood you during the Skype call. I thought you are waving the attendance fee of $1450, instead of reducing the price to that." - I did not misunderstand. This was my polite way of telling your organization to go away. And again, instead of arguing about what you did and didn't say, please look at the totality of the comments about your tactics from the many other founders in the links above. I am not unique. Our e-mail thread, since you are quoting is below. Many thanks for speaking with me last week, and great to hear the progress you are making at ZappyLab. The great news is that ZappyLab will be joining Tim Draper, Jim Breyer, Tony Hsieh and many more at Collision as part of the Collide startup track. We had an awesome time last year and are looking forward to showcasing some of the most promising early stage companies across the globe and providing them with a truly valuable experience. This is your code CLD1534g - and it should be used to register here. Your place is reserved until this Friday, February 6th at 5pm GMT. Unfortunately we need to be strict with this deadline as a huge amount of companies have applied and pricing will increase as we reallocate places down our waitlist. However, I misunderstood you during the Skype call. I thought you are waving the attendance fee of $1450, instead of reducing the price to that. While I understand the value of such meetings and would love to participate, I have a general reservation against paying for conferences as a young startup. Our registration fee at LeWeb was waived. Few days before that I was at the biggest Cell Biology conference where I was invited to speak and got a booth, with registration and booth fees of $3,000 waived entirely. This coming Sunday I am going to the SLAS2015 biotech/pharma conference in D.C. - my registration, flight, and hotel are covered. On February 22nd I am going to present at the annual NFAIS publishing meeting where my registration is waived and I am reimbursed $500 for travel. I would be happy to participate in the Collision conference and pay for the travel and lodging, if the conference registration was to be waived. Otherwise, I am afraid that I have to decline the invitation. And your response to my e-mail? A series of impersonal spammy reminders, totally ignoring my reply. Just following up on the below. The deadline for registration for Collide is 5pm GMT tomorrow. If you have any questions please do not hesitate to drop me a mail. And in case you missed it, we've just announced more speakers including big names from Google & Facebook, as well as more investors coming to Collision. Just a final reminder that the deadline for purchase is 5pm GMT today. The announcements keep on coming, we've also announced 8 top journalists joining us at Collision.